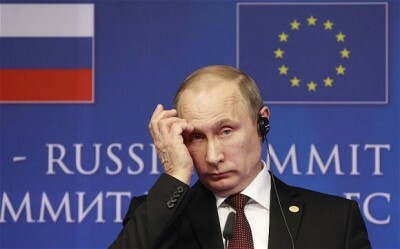 Russian President Vladimir Putin attends a joint press conference on Jan. 28, 2014, following an EU-Russia summit at the EU Headquarters in Brussels, Belgium. The European Union and the United States imposed economic sanctions on Russia in late July, targeting the Russian energy, banking and defense sectors to punish Moscow’s support for rebels in eastern Ukraine, the West’s toughest steps yet. The United States and European Union denounced the vote as “illegal and illegitimate”, but Russia has said it would recognize the result, deepening a crisis that began with the popular overthrow of Ukraine’s Moscow-backed president in February and Russia’s annexation of the Crimean peninsula. Is Russia feeling the pressure? Guest 24 posts in a row coming soon.. (research obligations). Hind 24 posts in a row coming soon.. (research obligations). Not at all. But WW3 is inevitable if Russia continues unchecked. Imo sanctions are the best way to put countries on the negotiating table if they work, but with many countries under sanctions still doing as they wish, it is questionable if they work in todays society or if leaders could care less about their countries. What’s unchecked, does Russia have offensives intentions.. i didn’t hear about anything, other than NATO wants to build a military base on Russians borders, what would the US do if Russia wanted a military base on US borders?That would be funny. If NATO wants to build a military base on countries that support it, that is legal. If Canada or Mexico wanted a Russian military base on its border, it is free to do that. So long as it isn’t an aggressor, no rules are violated. But Russia does have offensive intentions, that is why its allies are limited. i know.. but it was the Soviet Union under Khrushchev. Box the extra food and send to the Starving …. add 9 billion to the ‘donation’ charts.